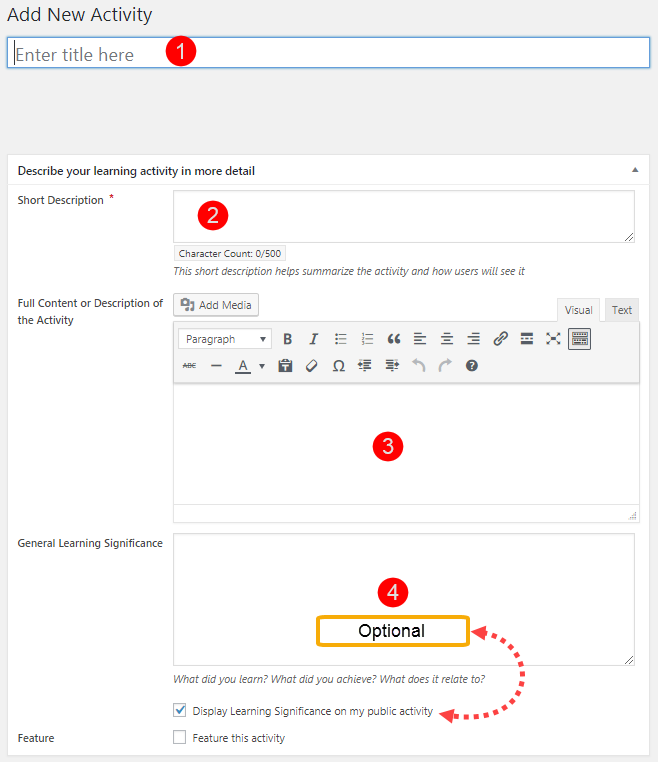 For ideas on what content to include in your activity pages, see the information panel to the right (or bottom if you are on a mobile device). Short Description – This is the short blurb that appears along with the thumbnail on the main and sub-category pages. Tip: It’s recommended to use an image that is 300×150 or proportionately larger to those dimensions, otherwise the image may be skewed or pixelated. 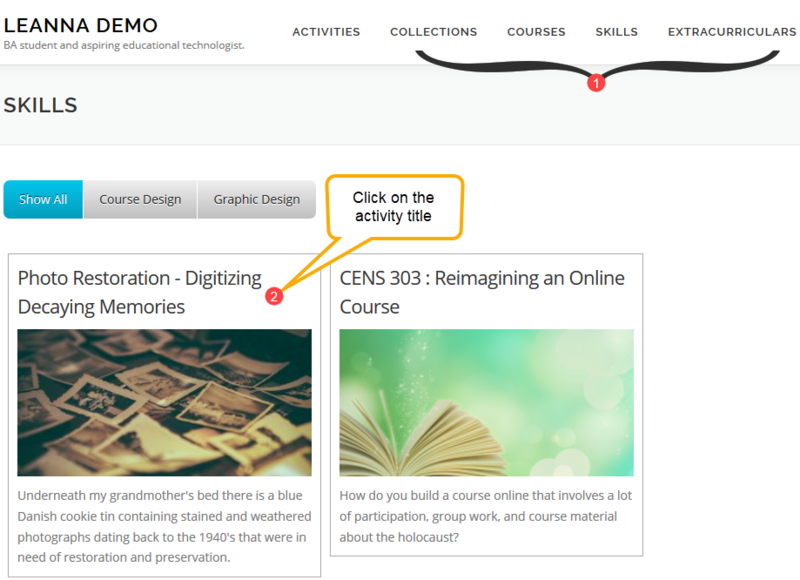 From the Website View, go to the category (Collections, Courses, Skills, Extracurriculars) that contains the activity. By default, viewers can share your activity posts through social media by clicking on the icons located at the bottom of each one. “Activities” are the evidence of your learning or growth. It’s meant to be a totally general term. Think of each learning Activity as a particular thing you have done in a course, in a job, in a community role, in a club or athletic team, or travelling. The Activity could be something already complete or something in process that you will continue to edit over time. Your Activity post is just a record of what it was and a reflection on its role for you in your overall learning and development, whether that learning is academic, professional, or personal. It could be an essay, or a video project, an economic analysis, a psychology experiment, a take-home exam, or something you prepared while working in a job, or a big game, or a visit to a museum. It could even be a meal! If the meal was memorable and something that connected to your learning or make you really think about something. Consider how you can engage your audience through the Short Description of your Activity. 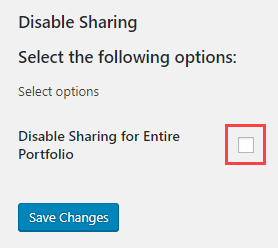 The Short Description is only visible in the full list of Activities on the home page or when the Activity appears in a grid when grouped with other similarly categorized Activities. Because of this, the Short Description (along with an accompanying Feature Image) functions as the “book cover” from which your audience will decide whether to click or scroll past. When posting (and later editing) an Activity, you should consider the best way to capture and represent the project and/or experience within the Full Description of the Activity. To do this, you must also consider the website platform and how your audience will be viewing and interacting with the posted Activity. It might be as simple as entering a text summary of an essay you have written, followed by a reflection of what you learned by doing this Activity and uploading the paper for your audience to access. 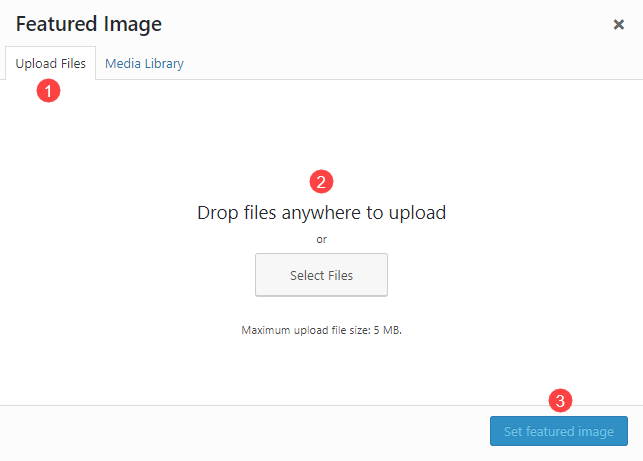 If you are adding images and media to better communicate your learning Activity, the files and links are to be placed right there in the Full Description area, just as in any blog post. The image will be cropped, so consider this before uploading. Keep the image large to retain size and quality; you can crop it when adding it to the Activity.